New investments: Gujarat pushed to eighth position, even UP and Rajasthan overtake "India's growth engine"
It is not just in investments completed that Gujarat is lagging behind several states (click HERE to read). 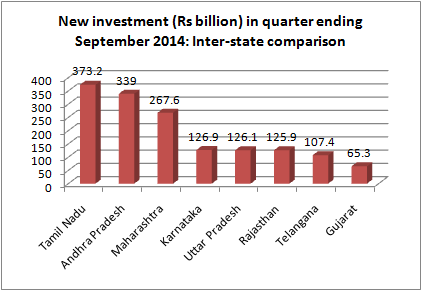 The situation has turned worse for new investments in the state, regarded as “growth engine of India”. Analysis carried out by a researcher with India’s premier independent research body Centre for Monitoring Indian Economy (CMIE) suggests that while Tamil Nadu tops the list of states with new investments in the quarter ended September 2014, Gujarat ranks eighth, with six other states performing better – Andhra Pradesh, Maharashtra, Karnataka, Uttar Pradesh, Rajasthan and Telangana. “Tamil Nadu topped the charts with new investments worth Rs 373.2 billion, highest in the past four years”, the researcher said, adding, important contributors were announcement by the Ministry of New & Renewable Energy (MNRE) to set up a 4,000 MW Tamil Nadu Solar Ultra Mega Power Project (UMPP) for Rs 260 billion, and the State Industries Promotion Corporation of Tamil Nadu Ltd (SIPCOT) announcement to set up a thermal power project at Tuticorin, with an investment of Rs. 32 billion. Other “slew of industrial projects” announced by the Tamil Nadu government included “a desalination plant has been proposed at Kadaladi in the Ramanathapuram district, with Rs 15 billion investment and a capacity of 15 million litres per day (mld). Another Rs 72.7 billion investments were announced by the state government in the storage & distribution segment”, Deo said. Then was the turn of Andhra Pradesh, which stood second with “substantial new investments” worth Rs 339 billion”. Of this, Rs 170.5 billion (nearly 50 per cent) was the solar energy sector. “Andhra Pradesh government signed a Memorandum of Understanding (MoU) with the National Thermal Power Corporation (NTPC) for setting up a 1,000 MW solar park at Kadiri in Anantapur district at Rs 70 billion. It signed a MoU with NVVNL (NTPC Vidyut Vyapar Nigam Ltd) as well, for 1,000 MW Kurnool Solar Project at Rs. 65 billion. The Andhra Pradesh Power Generation Corp Ltd (APGENCO) has also announced a 500 mw Kadapa Solar Power Project costing Rs 32.5 billion”, the researcher noted. Karnataka came fourth -- it saw new investments worth Rs 126.9 billion, mainly in the steel industry. “Kalyani Steels has planned to double the capacity of its carbon alloy steel plant at Koppal to 1.4 million tonnes, at a cost of Rs. 55.3 billion. While, Sandur Manganese & Iron Ore Ltd received a Terms of Reference (ToR) approval from the Expert Appraisal Committee (EAC) for expansion of its existing ferro alloy plant capacity at Hanumanhalli in Hospet district”, Deo said. “The sixth rank was of Rajasthan, which announced new investments worth Rs. 125.9 billion, mainly in the power sector. On September 1, 2014, Adani Power announced to expand the capacity at its Kawai Coal Based Thermal Plant by 1,600 MW (two units of 800 mw each) to 2,920 MW, at a cost of Rs 91 billion”, Deo said. And, the seventh position in new investments was of Telangana, at Rs 107.4 billion. “Bharat Heavy Electrical Ltd (BHEL) is in talks with the Telangana government for engineering, procurement and construction (EPC) order for the Manuguru Coal Based Thermal Power Project. The Rs 43.2 billion project entails four units of 270 mw each. Southern Power Distribution Corporation of Telangana Ltd (SPDCT) has also proposed to set up a 500 mw solar plant at Adilabad, with an investment of Rs. 32.5 billion”, the researcher said.